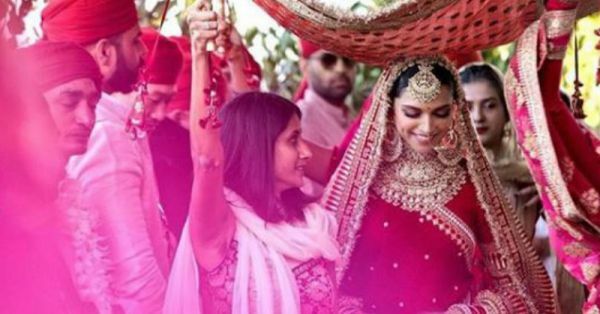 #DeepVeerKiShaadi: EVERYTHING You Need To Know About Deepika's Bridal Looks! Deepika Padukone and Ranveer Singh sure kept us waiting for their wedding pictures, but now that they are finally out, it's safe to say that they were totally worth the wait. The last few days have been all about DeepVeer and their much-awaited wedding at Lake Como, Italy. And when the newlyweds finally posted their wedding pictures on Instagram, all hell broke loose (and we mean that quite literally) because they looked like the picture-perfect couple. Dressed in designer ensembles, DeepVeer's pictures made us believe in love and holy matrimony. Wouldn't you agree? 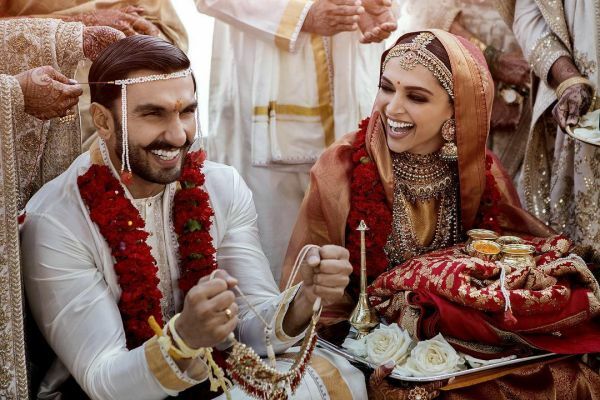 There were two wedding ceremonies for DeepVeer ki shaadi - one was in a traditional Konkani style pertaining to Deepika's culture that took place on 14th November, and the second one was an Anand Karaj according to Ranveer's Punjabi heritage that took place the following day on 15th November. So, let's get to the point. Are you a bride to be? Or just a lehenga enthusiast who lives on bridal magazines? Then here's a complete breakdown of both of Deepika's bridal looks for you. Whether you're a south-Indian bride or a Punjabi one or neither, take cues from DP to nail your wedding day in style. For the Konkani wedding, Ranveer wore a traditional south Indian poshak. He was dressed in a lungi and kurta set with an angavastram or dupatta in white and gold by Sabyasachi. Deepika, contrary to initial information, was not wearing a Sabyasachi saree. When DeepVeer shared the first pictures from their wedding, they did not share any details about what they were wearing. 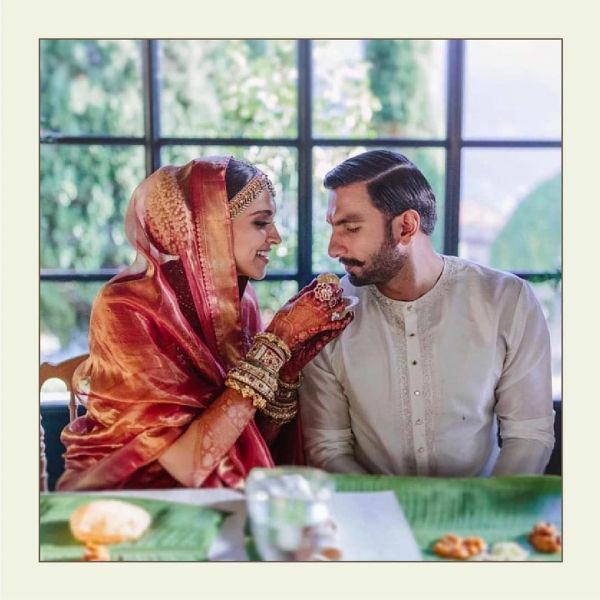 Then, Sabyasachi took to Instagram and announced that "Deepika Padukone and Ranveer Singh head-to-toe in Sabyasachi for their wedding in Lake Como, Italy..." assuring us that Deepika was indeed a Sabyasachi bride when she was really not. Later, he issued an acknowledgment to the saree brand giving them due credit for Deepika's Konkani bridal look. Now, in case you didn't know, as per Konkani tradition, the red and gold saree that Deepika wore to the wedding was gifted to her by her mother, Ujjala Padukone. The saree is from the Bengaluru-based brand called Angadi Galleria and was modified only a little by Sabyasachi. Here is everything you need to know about Angadi Galleria, the saree brand that Deepika's mom is completely obsessed with. In fact, Deepika's gold silk Kanjivaram saree for her Bengaluru wedding reception has also been handcrafted by the same saree brand. And, this too, was a gift to Deepika from her mother. Looks like DP gets it from her mamma. According to the owner and design head at Angadi, Mr. K Radharaman, who also designed Deepika's reception saree, the gold saree that Deepika wore at her reception cost Rs 1 lakh and took two months to make. Impressive, isn't it? She was styled by Sabyasachi himself for the occasion and wore a Zambian emeralds statement choker set from the designer's jewellery line. If you look closely, the mathapatti was studded with pink and green stones along with baby pearls. Covered in gold plating, everything about Deepika's mathapatti was exquisite and royal. And another reason why we, and we're sure you can't either, can't get over these pictures! A choker necklace along with a longline necklace, traditional dome-shaped jhumkas, and a statement maathapati - all by Sabyasachi's Heritage Jewelry Collection - completed her traditional south Indian look for the Big Day. "Featured here is @deepikapadukone in our label Advaya by The House of Angadi. The saree is a pure gold zari Kanjivaram brocade Silk, with Gandaberunda (two-headed bird) motif. ", wrote Angadi Galleria. Her saree had a sheer pallu that drew our attention immediately to her gajra-wrapped bun that looked oh-so-gorgeous. Characterized with the typical zari border, that is an imperative part of Kanjivaram sarees, Deepika's bridal saree was beyond beautiful, to say the least. But, in case you didn't notice, Deepika wore a third outfit at the DeepVeer wedding. As seen in the above picture, Deepika sported a white and gold saree at some point during the Konkani wedding ceremony, while Ranveer continued to wear the same clothes. It is said that in Konkani tradition, the bride changes her saree once again for the ceremonies and rituals after the wedding is concluded. Unfortunately, we aren't sure who is the designer behind this one. But needless to say, she did change her jewellery to match her outfit. As much as can be told from the one and only picture of this look that is out there, Deepika was wearing gold danglers and green bangles, but her hairstyle remained the same. What a beautiful bride she makes, ugh! Wait until we move onto the next look from DeepVeer ki shaadi. We couldn't stop swooning over Deepika's breathtaking bridal lehenga that she wore for the Anand Karaj. She looked no less than royalty in this elaborate red and gold lehenga by Sabyasachi. Ranveer too was dressed in Sabyasachi and wore a sherwani, a traditional Punjabi attire for the groom. He accessorised with a layered ruby necklace and a multi-stoned kundan and emerald necklace in the shape of a bird, how very Ranveer! The couple was twinning in red and ever since their pretty in pink mehendi, they haven't stopped #WinningAtTwinning. They were even seen wearing colour-coordinated outfits by Sabyasachi at the airport too. We have to admit, nobody looks better while travelling than our newlywed couple. So much for their Sabya obsession! Her exaggerated maangtikka oozes drama as much as her circular earrings and that statement nose ring. No points for guessing that she wore a bridal jewellery set by Sabyasachi. 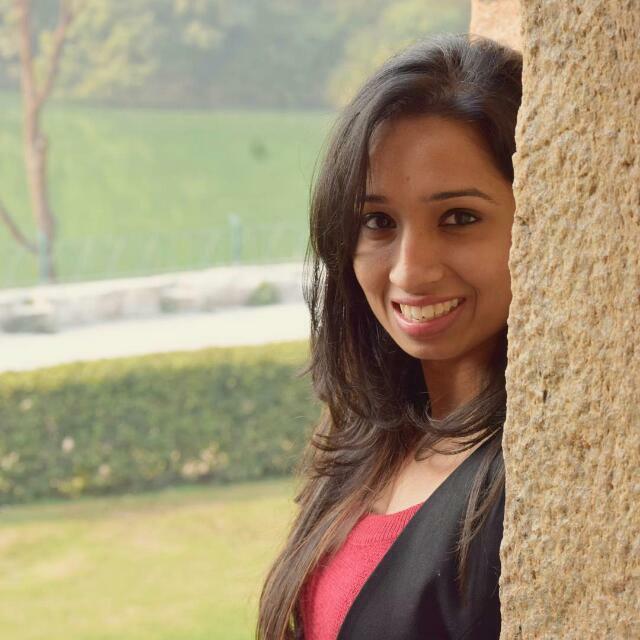 But, her chooda and kaleeras were from the jewellery brand Raabta by Rahul. And while, she was covered completely from head-to-toe in jewellery, and not a sliver of skin peeked through, Deepika looked as elegant as ever. Deepika was wearing statement rings in all her fingers but we have our eyes on only one; that emerald cut, 20 carats (our guess) solitaire ring that Ranveer gave her! Although, we are a little confused about the exact design - what looks like a two-solitaire ring could also be three - we are sure we want something like this ruling our ring finger. We needed a pair of shades to look at that large blinding solitaire. Here are all the details about Deepika's giant engagement ring. Dear bride-to-be, add such custom-made details to your wedding ensemble to make this day truly memorable. After all, you only get married once! I just double tapped for the hundredth time, can you feel me?